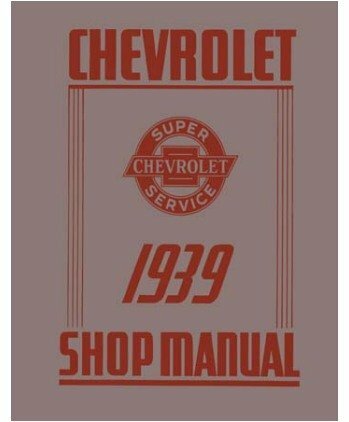 1939 CHEVROLET CAR & TRUCK REPAIR SHOP & SERVICE MANUAL - GUIDE - INCLUDES: JA Master Deluxe, JC 1/2-Ton Truck, JD 3/4-Ton Truck, JE 3/4-Ton Truck, Master 85, Sedan Delivery, VA 1 1/2-Ton Truck CHEVY 39 This is a reprint of the manual that a Chevrolet dealer mechanic would use to service cars, trucks, and pickups. It contains complete information on the construction, maintenance, and repair of Chevy vehicles. You will find step-by-step instructions on lubrication, frame, shock absorbers, front suspension, front & rear axle, universal joints, front & rear springs, brakes, engine, fuel system, cooling system, clutch, transmission, vacuum gear shift, fuel tanks, exhaust, steering gear, wheels, tires, chassis sheet metal, electrical system, and radio repair. Lots of clear black and white pictures, illustrations, wiring diagrams and specifications clarify the instructions. This book covers all 1939 Chevrolet cars and trucks. Buy now to own the factory manual for your Chevy.